How do I setup FTP in my DNS? Step 1 – Login to the DNS, and click “Management” in the top menu bar. Step 2 – Click “Application Management”. This will open the FTP Server settings page. 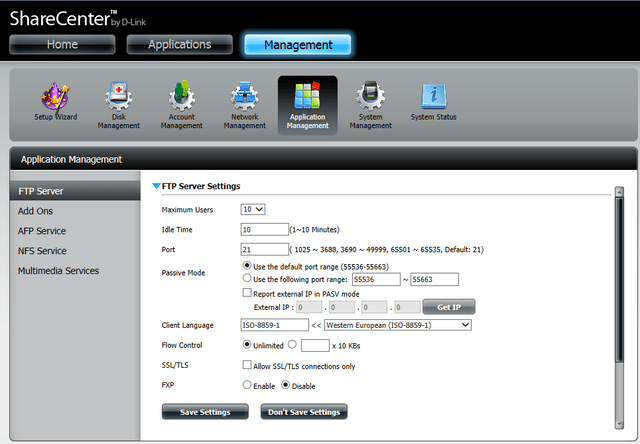 Step 3 – The default values should be sufficient to get the ftp server running. This will allow local access to the ftp server. If you make any changes, please ensure you click “Save Settings”. 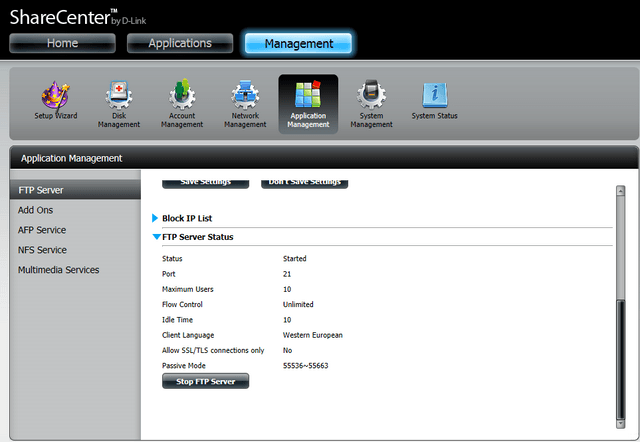 Step 4 – Scroll down, and click “FTP Server Status”. Here you can start or stop the ftp server. Step 5 – If you want to access the ftp server from outside your LAN, then you will need to setup port forwarding in your router, to forward the ftp server port (port 21 by default) from your router to your NAS. You will then be able to access your NAS ftp server using your public IP address of dlinkddns hostname if you have one.